Next week I will be in KC doing a road trip with Alex. We plan to cover many roads and freeways there, and in Wichita as well as spur over east to clinch I-49 in MO from the southern end near the AR Line up to the Grandview Triangle. I know Alex says there is a nice shield assembly in Downtown KC of the interstates combined with a dash between the two numbers of 35 & 70, courtesy of another road enthusiast here who tipped him off of it. There is also the Johnson County work that was under construction last year when I passed there as well that is near or all the way completed. Also word is that K 10 is extended on freeway pavement further west into Lawrence. Anyway, anything else worth seeing in that area, or even in Wichita? Also did the Kellogg and I-235 project get started yet? Any progress there too? I would appreciate any help as I would like to see all road things if I can. 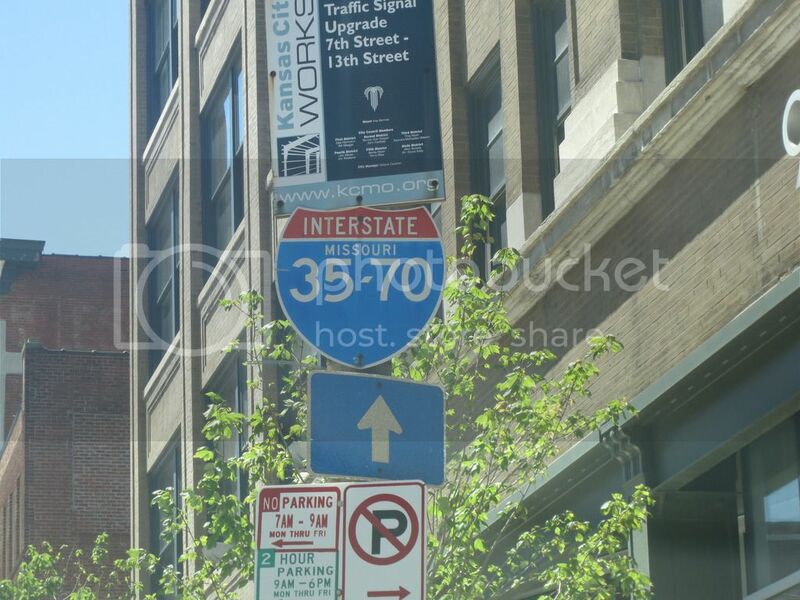 I know Alex says there is a nice shield assembly in Downtown KC of the interstates combined with a dash between the two numbers of 35 & 70, courtesy of another road enthusiast here who tipped him off of it. Reminds me of my trip in 08 to Indy as there was something similar back then there with both I-65 & 70. They seemed to have removed a lot of them in the last few years. I remember there being more around the actual freeway, but they appear to have been replaced with separate signs mostly. The KC one looks strange with that italicized dash. 235 and Kellogg is currently under active construction, and not all ramps are open at this time. It's definitely worth seeing, with large work underway. Near Kansas City, 95th at I-35 is a DDI, 87th is a SPUI whose bridge was designed by a good friend of mine, and that same edit northbound also serves the former Tunnel to Nowhere. These are all in close proximity. There's a new bridge that just got done a few months back on I-70 just west of I-435 on the Missouri side that may be worth taking a peek at. The Blue River bridges between US 40 and I-435. Saw the the construction last year and and would like to see the the completed project. Is the work work finished on I-35 at the merge with US 69 at Liberty finished yet? Been adding a ton of content to the site and looking around and have a few stops in mind. One is the high level level pedestrian bridge above I-670 to the west of Summit Street. Is that worth checking out, or does the decorative fence block the view? Also is the lower deck of the Central Avenue Bridge over the Kansas River permanently closed? Saw that on GSV and wondered. Would like to see that that double deck 12th Street viaduct too. If you're near downtown KCMO at mealtime, Red Dragon House near 8th and Broadway is the best Chinese restaurant my wife and I have ever been to.